Last weekend, amid the chaos of the 2017 X Games, Indian Motorcycles unveiled a new bike in Minneapolis. For me, it was a weekend of firsts: First time trying to find the top speed of an Indian. First time getting the cops called on me for doing burnouts on an Indian. First time jumping an Indian. First time meeting Monster girls, instead of old guys with white ponytails and leather vests, as a direct result of riding an Indian. Since its reboot in the mid-2000s, the brand has focused on retro looks to invoke nostalgic feelings of Americana—and to compete with Harley-Davidson’s stronghold on the American cruiser market. While that’s worked fairly well, it’s really only helped Indian compete for the baby boomer riders who are beginning to hang up their helmets. That started to change early this year, when parent company Polaris closed their “modern” cruiser brand, Victory, to free up manpower and resources with the goal of attacking the cruiser scene at full throttle. Finally, Indian could push outside of that tassels-and-leather-fringe bubble. The first step in this new direction, and the reason I headed to Minneapolis last weekend, is the 2018 Indian Scout Bobber. The Bobber comes as more of a restyled iteration of the Indian Scout than a whole new bike, keeping the same frame, motor, tank and brakes. The idea was to make a sleek, aggressive and more stylish version of the Scout, and Indian made a couple of key changes to get there. The Bobber gets a tracker-style handlebar and pegs moved an inch and a half closer to the rider to make for a sportier seating position. The rear shocks have been shortened for an inch less suspension travel, which harshens the ride only slightly and, more negatively, decreases lean angle clearance a few degrees—translation: you’ll be scraping pegs left and right. Fortunately, they’ve also swapped the old spring fork for a cartridge unit, which makes the bike feel way more stable and sporty. To complete the look, Indian coated the wheels, exhaust and engine covers black, added vented exhaust shields to the headers, blacked out the instrument panel and updated the badging on the tank. The old stalk mirrors are gone, replaced now with bar ends that can be fixed above or below the bar, and a nacelle now shrouds the headlight. Riding the bike is all of the good things about the Scout and then some. The 69-cubic-inch V-Twin motor pulls way harder than any comparable Harley, and the more commanding riding position and added leverage over the bars really takes advantage of the beautiful chassis Indian built. The pegs could still be moved even closer to the rider to feel more natural and keep the rider from feeling like they’ve been folded in half, but shorter riders won’t have as much of a problem. Indian’s aftermarket parts catalog has a ton of rad accessories, from performance mods like intakes and exhaust systems to style bits like different seats and higher bars. There are also a few little luggage options for you daily commuters, and a passenger seat option. So what does all this mean for the motorcycle novice? The Indian Scout Bobber is a great choice for anyone looking for a cool cruiser to rip around town, commute to the office or take someone special on a date. And it’s great for those of you looking at getting into motorcycling, as its low seat height and center of gravity help make it incredibly easy to ride. But make no mistake: The styling and riding position of the Bobber will bring out your inner hooligan—or at least that’s the effect it had on me. (Having Red Bull stunt rider Aaron Colton along for the ride didn’t help.) 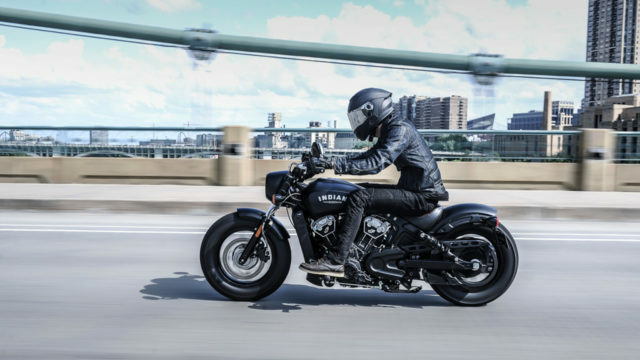 I took the Bobber for a 101-mile jaunt around Minneapolis, and what would have been a mellow putt turned into rolling burnout and seeing how much of the peg feelers we could shave off in the turns. Hey Indian, I like your style. Previous articleWhy Did 63,000 People Cancel Their Tesla Model 3 Preorders?